The nominations received comprised of prominent individuals, institutes, organizations and NGO’s working to develop and promote education as a main vehicle to drive socio-economic development in Africa. The eventual winner(s) of the prize will be selected by the Al-Sumait Board of Trustees, which comprises prominent international personalities in the field of development in Africa and world-renowned philanthropists. The Board is chaired by H.E. Sheikh Sabah Khaled Al-Hamad Al-Sabah, First Deputy Prime Minister and Minister of Foreign Affairs of the State of Kuwait. Other trustees include Mr Bill Gates, Co-Chair of the Bill & Melinda Gates Foundation, Dr Kwaku Aning, Deputy Director General and Head of Department at the International Atomic Energy Agency, and Mr Abdulatif Al-Hamad, Director General and Chairman of the Board of the Arab Fund for Economic and Social Development. 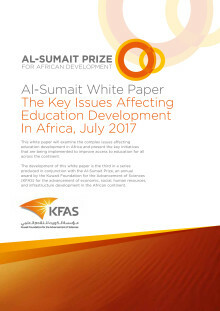 “An exceptional number of praise-worthy nominations have been received from both individuals and organizations for the Al-Sumait Prize Education Category, which provides a great opportunity to promote pioneering education development throughout Africa by bringing scientific, technological and social ideas to life,” says Dr Mustafa Marafi head of the KFAS Prizes Office. The annual Al-Sumait prize, which is worth one million dollars, is awarded for significant advances in development in the categories of health, food security and education for Africa. Announced by the Amir of the State of Kuwait, H.H. Sheikh Sabah Al-Ahmad Al-Jaber Al-Sabah in November 2013 at the 3rd Arab African Summit, the aim of Al-Sumait Health Prize is to contribute significantly to solve major health development challenges facing African nations. The prize celebrates the life of the late Dr. Abdulrahman Al-Sumait, a Kuwaiti physician who devoted his life towards helping the poor in Africa.